Most of the technical information (weights, construction, etc) below came from 2 sources: Dupont <1> and Material Concepts <2> websites. The Material Concepts site has tons of info on Tyvek and I suggest you check out the site. Tyvek® is a registered trademark of E. I. du Pont de Nemours and Company or its affiliates. In this article I focus on the types of Tyvek that can be used in making gear for outdoor activities. The two main types of Tyvek that I focus on are Tyvek for hard sided structures (HS) and Tyvek for soft sided structures (SS). I am by no means an expert on Tyvek and I am doing this mainly to answer questions concerning this versatile material and clear up some misconceptions. Chances are good that you’ve come across hard-structure Tyvek. The two most common examples are Tyvek envelopes used by the USPS and FedEx, and Tyvek HomeWrap, advertised as a windbreaker for your house. Hard structure Tyvek has a paper-like rigidity with a smooth slick surface. If you’ve seen Tyvek protective apparel such as lab coats, jackets, suits, or aprons, you’re familiar with soft-structure Tyvek. It has a soft fabric-like feel, and with use and handling it becomes even softer and more pliable, taking on a silky feel. 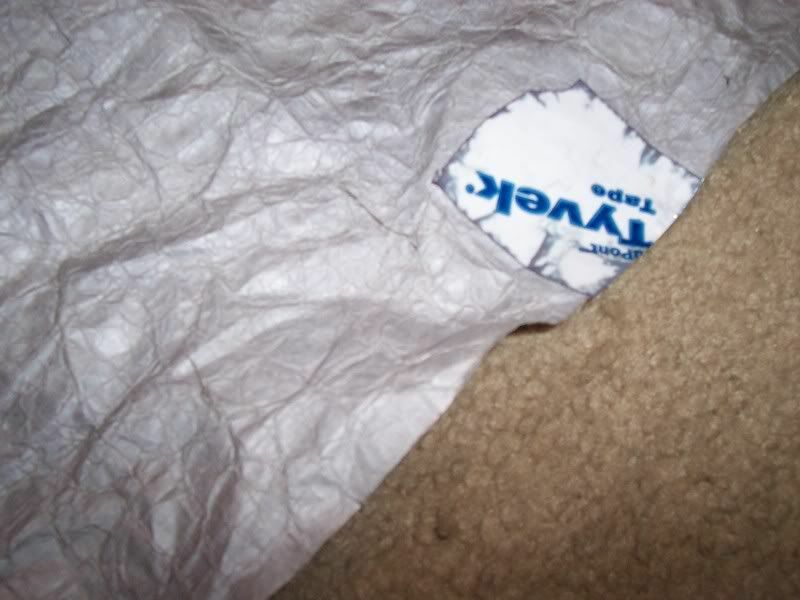 Tyvek has a unique balance of strength and softness. Durable and lightweight, it has an excellent strength-to-weight ratio. This is probably the most common form of Tyvek seen. It can be used to make tents, tarps, waterproof breathable barriers, ground cloths, etc. Many home improvement stores sell Tyvek home wrap in 10 foot wide rolls, though narrower rolls are also available. Rolls are generally fifty to 100 yards long, but eBay is a good source to find this Tyvek in smaller sizes/quantities. This type of Tyvek is stiff and noisy when new, but if you put the Tyvek in a washing machine on the delicate cycle with no detergent for 2-3 cycles, it comes out soft and much more fabric-like. Washing this type of Tyvek does not seem to affect the water resistance but can cause some shrinkage. Henry Shires (http://www.tarptent.com/) states that 5% should be added to measurements to allow for shrinkage if you are going to wash your Tyvek. Type 14 styles offer excellent wet and dry protection against particulate matter and provide an excellent barrier. Type 14 has high opacity and good surface stability. Personally, I would cover any sewn seams with Tyvek tape to strengthen the seam and eliminate water coming in the seam. hondo_mountaineering from White Blaze had this to say: Original Thread on WB. The best solution we have found is an adhesive transfer tape from 3M using the 300LSE adhesive. This tape makes a strong waterproof joint that stays pliable over a large temperature range, making it good for use in mountaineering/backpacking gear. The resulting seam is stronger than the Tyvek itself, and much stronger than a sewn seam. If you can't get the tape (often requires large orders) I recommend using outdoor carpet tape in place of stitching, though not ideal, it's still stronger than thread. Last edited by headchange4u; 08-13-2007 at 20:33.